Why do Russia and China still dance with the criminally insane and psychopathic leadership of the West? Because their culture and language are so different. They really don’t know what they’re dealing with. THERE IS ONLY ONE WAY TO EFFECTIVELY DEAL WITH A CRIMINALLY INSANE PSYCHOPATH—YOU DON’T! There is no better historical analogue for the current war between the East and the West than the relationship between the Native American Indian tribes across America and their European/American conquerors. What the Indians experienced was a never-ending and profound failure to understand that the suits in Washington were of a completely different ilk. And that their culture and language equipped them to frequently SPEAK WITH FORKED TONGUE. In a sense, the Russians in Moscow and Chinese in Beijing are representative of the Indigenous Peoples of both of their respective Motherlands. More than ever it appears that grounded and centered leadership has taken up residence in both the Kremlin and Great Hall of the People. However, the leadership of both Russia and China seems stuck in the past. It’s as though they really think that they can reason with the psychopathic and criminally insane leaders who now populate the upper echelons of the Anglo-American Axis (AAA). At this very late date, what is it really that they don’t get? Each successive administration in Washington, D.C. and London has shown themselves to be thoroughly duplicitous and fundamentally untrustworthy. Why, then, do Putin and Jinping continue to dance with them in so many ways? Anyone who has ever dealt with a cold-blooded psychopath ought to know straight up that there is ONLY ONE WAY TO DEAL WITH THEM. YOU DON’T DEAL WITH THEM! An incorrigible criminally insane psychopath only cares about itself. There is no “other”. There is only the interest of the psychopath that matters deeply to them. Therefore, there is never any agreement or compromise or mutual understanding … about anything of consequence. Even when they present every indication that they will follow the terms and conditions of an agreed upon contract (signatures included), they will not. Any apparent follow through is merely for show and deception. Every move is meticulously calculated as only a psychopath can stunningly formulate. Their every intention and initiative is oriented around them winning at all costs and never admitting defeat or weakness; unless, of course, it serves their self-serving goals and forever selfish ends. The bottom line is that THERE IS ONLY ONE WAY TO EFFECTIVELY DEAL WITH A PSYCHOPATH—YOU DON’T! If you do dance with them, they will either sweep you off your feet, or they will break both of your legs after they have broken both of your arms. Yes, they are that dangerous and treacherous, devious and deadly. Why then does Russian President Vladimir Putin continue to pay them any attention? Why does China forever put up with so much American meddling and saber-rattling? If ever there was a $64,000 question in 2016, this is it. Look it, Putin got caught flat-footed during the Sochi Winter Olympics in 2014 while the AAA madmen staged a coup d’état in Kiev which kicked off a terribly destructive civil war throughout the Donbass. Not only has the Russian economy been devastated by the subsequent illegal economic sanctions imposed by the White House, NATO has been empowered to literally take over the Intermarium. Moscow is only a stone’s throw from Kiev; in fact, only a mere 275 miles from the Ukrainian border. Russia’s Biggest Threat Is The Promethean Strategy: Can Putin keep the Intermarium in check? President Putin also got blindsided by the Zio-Anglo-American-ISIS collaboration that stealthily took over the northern Levant. In this regard his protracted period of inaction and very slow movement toward action in the face of a full-blown genocide led to Syria’s utter devastation as it did to much of northwestern Iraq’s takeover by the IS. When he did show up with the Russian Air Force, the military campaign did arrest ISIL expansion as well as expose the flagrant collusion of Turkey, Saudi Arabia and other major players of the AAA with the Daesh. Nevertheless, millions of innocent civilians were already displaced as hundreds of thousands were killed. Cities and infrastructure were completely destroyed, while monuments were demolished and cultural heritage sites desecrated. 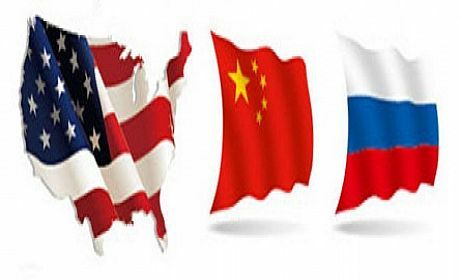 On the other side of the Eurasian continent China has been playing cat and mouse with the same psychopaths in Washington, London and Tel Aviv practically forever. Their willingness to let CIA agents dress up as charity workers and Christian missionaries and travel unimpeded throughout the Chinese countryside is as foolish as it is befuddling. The Chinese leadership even permitted the CIA & Company to stage the transparently fake Umbrella Revolution in Hong Kong back in 2014. While it was not successful, it did allow the Zio-Anglo-American agents to further solidify their subversive networks all over the highly strategic (both political and economic) island. Then there is the little matter of constant U.S. naval interference in the Spratly Islands dispute. Here again, Beijing seems to be quite willing to allow a high level of American provocation instigated by both sea and air. It’s obvious to the whole world that China has many weapons in its arsenal (especially financial and economic) by which to neutralize Western intrusion into their affairs. One would think that the exceedingly destructive Opium Wars would have taught them an unforgettable lesson about the nefarious schemes forever being hatched by the AAA against Chinese sovereignty. Herein lies the real problem. Just as the American Indian was clueless about how the white man could only speak with forked tongue, so too are the Chinese and Russians oriented the same way. The forked tongue is simply a manifestation of the Reptilian brain which is so much more well developed in the Anglo-American bloodlines. Such a lizard tongue once allowed them to protect themselves from foes both real and perceived. Apparently someone forgot to tell them that no one is going to eat them. Therefore, there is no reason for them to continue to attempt to eat everyone and everything else in sight. Isn’t that the very nature of Anglo-American predatory capitalism?! In terms of temperament and mindset, customs and traditions, the American Indian is much closer to the Chinese and Russian than they are to the Anglo-American. Their cultures express much more reverence toward the land as they have more respect for each other. Communist Russia only became a threat to the world after it was set up by the Western banksters who basically established a massive slave colony there. They did the very same thing with Communist China. Perhaps it’s time for the BRICS nations to master the ways of the AAA leadership, and to only deal with them when they are truly ready to bust them upside the head with a four-by-four. That, by the way, is the only language that a criminally insane psychopath really understands. Just like the American Indian chiefs were consistently and brutally deceived by their counterparts in Washington, so, too, are the Russians and Chinese. After watching India being co-opted by American diplomacy, Brazil completely shut down by the CIA-coordinated political crisis and Zika virus bioweapon and South Africa paralyzed by the latest actionable charges against their prime minister, it ought to be obvious that the AAA criminally insane psychopaths will stop at nothing. Undoubtedly, it’s all they know how to do but pursue their conquest with perpetual wars and genocides, diplomatic conflict and resource theft, as well as false flag bombings/shootings and strategic assassinations. The American Indian never got it. Not even when they were frog-marched off their ancestral lands and herded onto suicidal reservations did they get it. After so many centuries of outright warmongering on their soil, one would think that the Russians and Chinese would issue the appropriate ultimatums to the AAA to cease and desist … … … and to stay the hell away from their respective motherlands for good. But “No”, even after centuries of irreparable damage caused by the Great Game in Russia and the never-ending Opium Wars in China (they have only morphed into a different form), these two great powers still continue to dance with their Western ‘partners’. Putin himself likes to refer to those AAA criminally insane psychopaths as his ‘partners’. In so doing he unwittingly encourages them to work their mischief with awesome consequences. Perhaps his strong Christian faith has blinded him to the notion that: THERE IS ONLY ONE WAY TO EFFECTIVELY DEAL WITH A CRIMINALLY INSANE PSYCHOPATH—YOU DON’T! It’s only fair to point out that the American people, as do the British, address their leaders as though they are NOT criminally insane psychopaths. Both citizenries are so addicted to deception that they have enabled and empowered their deluded politicians to literally destroy the world. If the folks in the USA really knew what their leaders were all about, they would surround the White House and Capitol Building and run them out of town. So the real problem here starts with the U.S. citizenry and their dire lack of appropriate response. The fate of the American Republic now hangs in the balance. This essay is one of an 8-part series on Vladimir Putin’s Russia, the emergence of the BRICS Alliance, the decline of the Anglo-American Axis and the current cold phase of WWW3.